ubuntu/xubuntu 18.04 kernel crash during install. I've been trying to install ubuntu 18.04, but the system crashes with a kernel panic and thus won't run. So how do I report this bug? There is very little data gathering that I can do, as the system will not boot, not even into text mode. PS. This back door way of creating a bug report is very poor when dealing with systems that don't run. To change the source package that this bug is filed about visit https://bugs.launchpad.net/ubuntu/+bug/1772038/+editstatus and add the package name in the text box next to the word Package. My system will not run ubuntu or xubuntu 18.04, thus I can not collect log files. I have downloaded 8 versions of 18.04 from several different mirror sites. I have not directly confirmed the checksum on any of these downloads. I have burned 10 DVDs with 2 different burners all using Windows 10. All versions and copies crash in the same way. I have downloaded and installed Xubuntu 17.10 and it works without any issues. I've run the memory test from 17.10 on the machine and no problems were found. I have then run the distribution upgrade from 17.10 to 18.04 and upon reboot the same kernel crash occurs! HP-Compaq DC5800 small form factor, 4 GB Ram, Seagate 1TB HDD, ATI/AMD Radeon B530 video card! You need to install the linux-modules, linux-modules-extra and linux-image-unsigned .deb packages. Does your device boot UEFI or BIOS? The small bit of crash we can see looks like some kind of talk with the bootrom. If you can remove the video card that may also be the issue, they have been known to cause problems with just about everything. To debug without graphics (if your cpu/motherboard doesn't have intergrated) is to connect a serial console. 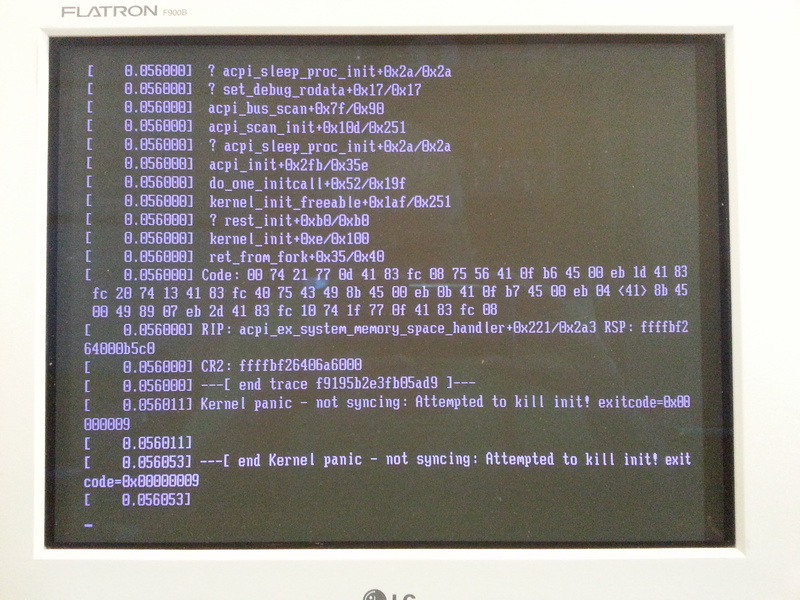 jsailsbury - I think the crash will still occur, as it is a kernel crash, and it looks like it is in a hardware method. there is another way to do this pls let me know. > You need to install the linux-modules, linux-modules-extra and linux-image-unsigned .deb packages. I have 2 of these computers, the 2nd computer has 8GB of memory and 1TB HDD, same video card, but this second computer has a WiFi card installed. I've tried several of the DVD's that I burned and I get the same results the only difference is the time stamps shown on the screen is different. On this second computer the crash happens quicker (ie the timestamps are lower). I'm currently downloading the 18.10 kernel and I'll report when I know more about this daily build kernel. jsailsbury I think it will still crash. > crash, and it looks like it is in a hardware method. Downloading the desktop image now, will report back later! Here is another observation, when I run virtualbox on 17.10, and then create a guest OS with 18.04 it runs fine, no kernel crashes. Thus this evidence seems to point to the fact that 18.04 is not playing nicely with the HP BIOS, but 17.10 does play nicely. 18.04 seems to have no problems with the virtual BIOS provided by VirtualBox. OK, I've had time to try the latest kernel from the daily-live/current directory called 'cosmic' and it does the same thing. I've tried it on my second machine and like I said earlier it has the same results but the timestamps are lower. I'll post a new picture of the screen results. After reviewing both screen shots I see that I miss read the timestamps in the first image, so the crash on my second machine has higher timestamp numbers NOT lower ones. Opps! Here is some other interesting observations. I've tried the new release of Fedora (F 28) which uses the latest kernel 4.16 (even newer than ubuntu's 4.15) and to no one's surprise, it produces the same result (exactly the same result). So this bug is in the Linux kernel, and is not limited to just ubuntu! If this bug is not going to be addressed by the linux kernel team, then please make that clear, so that I can determine the proper disposition of the hardware that will no longer run linux. Thanks! I have a similar HP dc5800 machine. Booting from 4.15 kernel after upgrade to Ubuntu 18.04 results in very quick kernel crash (less than 1 second), as does booting from the Ubuntu 18.04 "desktop" install DVD. In both cases booting with "acpi=off noapic" added to the kernel boot parameters works fine, except that the machine does not power down after "/sbin/shutdown -P". Oddly enough this machine worked fine with the 4.4 kernels from Ubuntu 16.04, so this might be a regression bug in the kernel? Some people there say that upgrading the BIOS to version 1.6 fixes the problem, so may be worth a try. Upgrading the BIOS to 1.6 does indeed seem to fix the problem. At least it is now allowing me to boot into live mode. It's taking a while, but is has gone past the kernel panic I was seeing earlier. For those having trouble with the DC580 on BIOS V1.3, it should fix the issue. Confirming this issue for USB installer for both 18.04.1 and 16.04.5 on HP Compaq dc5800. 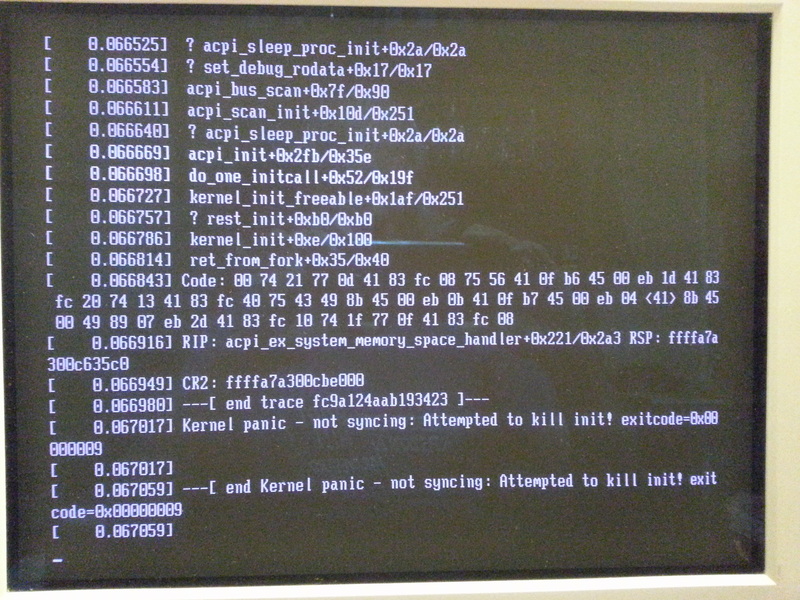 The "acpi=off noapic" kernel parameter workaroud works for installing the system. And interestingly, once installed to SATA drive the system boots and behaves normally. I'd be happy to try a new ISO or update the BIOS, for the purposes here. This is also affecting the 3 Lenovo Thinkpad T420s I have tried in all live/install and normal modes. I can only operate them with the acpi=off parameter, but in this case Standby/Restart/Volume controls don't work. Note: All 3 models have a dedicated nvidia card, which is switched off in the BIOS Menu. Ubuntu: How to report a bug if the system won't run?